We use this as the entry mat from the patio to the living room. Lightweight and thin but stays on our tile plank floor. Cleans nicely with the vacuum. this rug matches the bigger rug with the exact same design. we have the bigger style in the kitchen. we use the matching 2x3 rug in the hallway. it is perfect. it is a very durable rug and I ordered 1 more the same. This is a really pretty rug especially if you like red. It definitely has true red in it so the colors are very rich and bold. The picture is a very good representation. I got a small 2 x 3 area rug for in front of my fireplace so it looks beautiful there. If you had a place for a large one where the colors would work I think it would look very dramatic and stunning. I got it on a fabulous sale. The delivery was amazingly fast. I am going to buy this rug in some of the other sizes to match this rug to put into my adjoining rooms. 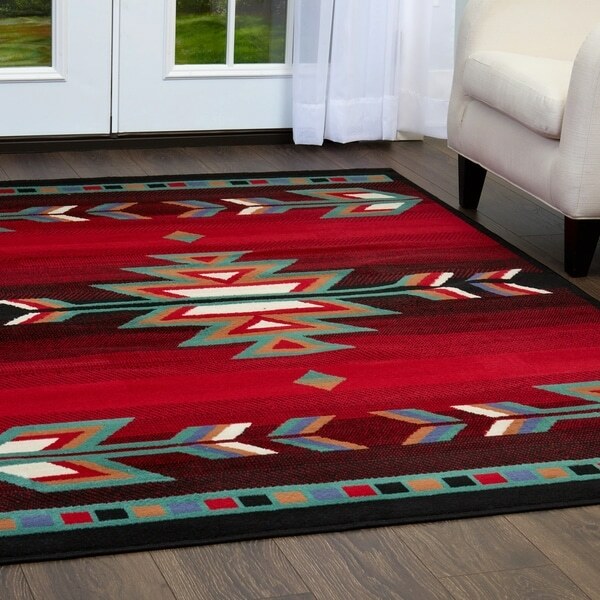 The colors are so bright and beautiful and matches my southwest decor beautifully. I thought I may need to get rug grippers to put under them but no need, they stay in place perfectly even with the traffic of of my three dogs. I was looking for a small area rug to go in front of my loveseat and just by guessing at the size and colors in this rug, It matches perfectly. Thank you OVERSTOCK.COM for having what I wasn't sure I wanted!! And at an excellent price. This rug was the perfect size and very durable. we bought two of these rugs. The product looks exactly as pictured. Colors have held up well with shampooing. This is not a thick rug but we only needed something that covered for traffic on our light colored carpeting. They accent two room perfectly, thin so not a rug to use in a large room unless layering. The colors are gorgeous. High quality rug; multi colored so it fits with almost any color scheme; easy to vacuum. My son was very happy with this rug as he has it non his bedroom. It arrived quickly and colors are true to images online. Good quality and not thick. Perfect size for my space. Easy to keep clean. Using in high traffic area. Love the design & coloring; not the material. Stiff, but pretty. "what kind of backing does this rug have and will it stay in place"
It doesn't have a backing, it is made like,cheap carpet. The colors and pattern are great but the binding is poor and it,will curl on the ends, easily tripping g someone. I vacuum it and spot clean and swear I am going to toss it but I love the pattern so it is in an area that is seldom walked on. You need a non slip mat under it. No could spot clean it. The backing is very stiff. I gave the rug to my son for his cabin. I have seen it several times and do know he & his small sons track it up. He says he just take it outside to clean with a brush.